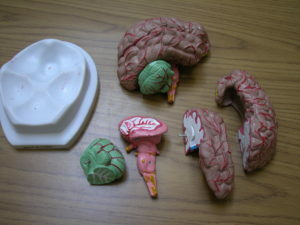 The University of Wisconsin-Madison’s Neuroscience Training Program offers a variety of neuroscience materials that can be loaned to local schools or individuals for science education. Below is a list of some of the most popular materials in our library but we have many more models and posters including, dissection kits, prism glasses, mirror boxes, neuroscience books, videos and much more. Please contact the program office for more information or to use these materials (608) 262-4932, ntp@mailplus.wisc.edu. Brain with Arteries This medially-divided deluxe brain model shows the brain arteries. Delivered on a removable base. Both halves can be disassembled into: Frontal with parietal lobes, Temporal with occipital lobes, Half of brain stem, Half of cerebellum. Giant Ear Model This model shows all major structures related to hearing and balance. Dissects into 3 parts. Giant Eye Model Dissects into vitreous humor, retina (anterior and posterior portions) and outer eye (2 parts). Giant Functional Brain The twice life-sized model calls attention to the emotional, sexual, memory, and learning functions of the limbic systems. Sensory regions are highlighted, plus sensory centers of the somatosensory cortex receptive to more than 20 specific body regions. More than 120 hand-numbered features are identified in the accompanying key. Sheep Brain Dissected with external and internal views exposed. Two median sagittal sections and 2 transverse sections. Neuron Model Schematic representation of the nerve cell and axon with medullary sheath and Schwann’s sheath.